Welcome to SereneComfort.com - an online store dedicated to comfort. We value your patronage and respect your time. Our commitment to you is that we will do our best to make your shopping experience a pleasant, easy, and serene experience from the time you first enter our store until you open your "packed with care" purchases. If you have any comments, suggestions, or questions, please email us. We love to hear from you! 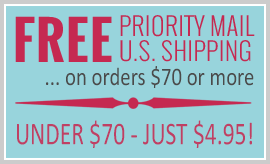 We are currently offering free shipping within the U.S. - no minimum! We ship by U.S.P.S. within 1 to 2 business days of the day the order was placed. Depending on the ship to address and the weight of the package, it will generally take 2-5 days to ship from our warehouse in Massachusetts. Packages weighing under 1 pound may be shipped by First Class Mail. Packages over 1 pound are shipped by U.S. Priority Mail. We are not offering expedited shipping at this time. To ensure that your order is shipped within 1-2 day business days of placing an order, you need to provide us with a valid U.S. Postal Service shipping address (U.S. Addresses only) and correct billing information (address and phone number must match the credit card billing address so that the credit card verification service approves - credit cards must be issued by U.S. financial institutions and associated with a U.S. billing address). We are unable to ship to APO/FPO/DPO addresses at this time. If you or a gift recipient receives your mail at a P.O. Box, please use that as your shipping address. *Approved Orders: To ensure that your order is shipped, you need to provide us with a valid U.S. Postal Service shipping address (U.S. Addresses only) and correct billing information (address and phone number must match the credit card billing address so that the credit card verification service approves - credit cards must be issued by U.S. financial institutions and associated with a U.S. billing address). If you or a gift recipient receives your mail at a P.O. Box, please use that as your shipping address. We will contact you within 24 hours if there is an issue with your order - please be sure to include a phone number where we can reach you in the morning in case we need more information. EXPEDITED SHIPPING: We do not currently offer overnight shipping. We ship by U.S. Priority Mail which takes 2-3 days. SHIPMENTS TO MULTIPLE LOCATIONS: Shipments to multiple locations on your order will be billed a shipping charge for each location. If you didn't receive your email with tracking information, please check your spam folder as our shipping system automatically sends tracking information to the email that you provided. If your attempts to locate the package are unsuccessful, please know that we will work with you to locate the package or replace if necessary. Our customer service team will be happy to assist you. We are now offering limited international shipments including shipments to APO, FPO and DPO destinations. Please click here for more information on international shipments. Credit cards must be issued by U.S. financial institutions and associated with a U.S. billing address. Credit and debit cards will be charged when you place the order. We are currently not offering gift wrap. Any gift message that you type into your order will accompany your order. Available by phone 8:30 AM - 3:00 PM EST Monday through Friday. If our customer service team cannot take your call immediately, please leave a message. All calls are responded to in the order in which they are received. From Serene Comfort Shoppers - View more testimonials here. At Serene Comfort, our goal is to offer you wonderful products meeting high standards of value, quality and comfort. Please take the time to check the size as soon as possible. If you do need to return your Serene Comfort purchases, please follow our return policy so that your exchange or credit will be as easy as possible for you. Serene Comfort Return Policies: Except as specifically noted, returns are accepted within 120 days of purchase when products are in new condition and are unworn, unwashed, with original tags attached and packaging materials included. Please be careful when trying on... we cannot accept returns of garments damaged by make-up, perfume, and stains. Shipping charges are not refundable. For Intimates: Due to our policy to maintain the sanitary condition of underwear for you and all buyers, ONLY unopened and unworn undergarments are eligible for a refund. FOR REFUNDS: If you are seeking a refund of the purchase price, please mark the outside of the package with RAR. Please include the packing slip or, if not available, your name, a daytime phone number and the order number (if a gift, please provide the purchaser's name). Please send the product, including all tags to the address below. After receipt of the return, your refund will take 10-14 business days. We cannot refund your original shipping charges. FOR EXCHANGES: If you are looking for an exchange, please mark the outside of the package with RAE. Please include the packing slip or, if not available, your name, a daytime phone number, the order number (if a gift, please provide the purchaser's name) and include the sku, size and color of the item you wish to exchange for. We will make the exchange promptly upon receipt of your return - we do not charge you the cost of shipping an exchanged item to you. If we no longer have your desired item in stock, we will contact you with alternate options. Please send the product, including all tags, to the address below. FOR EXPEDITED EXCHANGES: If you prefer an expedited exchange, please place a new order. We will send this order out right away and charge your credit card. We will refund the original purchase price and exchange shipping charge when we receive your return. Please mark the outside of the returned package with RAE-EX. Please include the packing slip or, if not available, your name, a daytime phone number and the order number (if a gift, please provide the purchaser's name). So that we can refund you the shipping charges of the "expedited exchange" order, please include the new order # as well. Please send the product, including all tags, to the address below. We recommend insuring the package for the value of the product as we cannot issue refunds or exchanges until we receive the returned product. Please notify us immediately if an item is damaged or defective for a special return authorization. Please be aware that some natural fibers contain weaves or other characteristics that are intrinsic to the fiber and not a defect.